Bravo! Grateful to see the factory education model is being replaced with a model more logical, practical, and compassionate … respectful. I’m sure it will also do wonders with developing children’s ability to socialize without all the stigmas and prejudices typical of the factory education model. Well done! I began as an “A” student because of abilities and passion for learning, but the learning and social environment of our factory school model, plus other mitigating factors, transformed me into a “D” student, mostly by absenteeism by grade nine and a drop out in grade ten. Fortunately my drive to learn pushed me to acquire my GED, earn Honors in Business Administration at age thirty, compelled me to attend York University in my late thirties … but again the environment was not the best for me. so I just continued my studies on my own. In my forties, I began Design and Communication Arts studies at Durham College and switched to Visual Art studies when I moved from Oshawa to Etobicoke. I still have two courses to take before receiving my diploma, but then again, I was selling visual art before taking any school courses, plus I had been merchandising product for retailers since my late teens. And my education continues as I primarily read non-fiction to satisfy both my personal and professional goals, including as an social entrepreneur who founded a company to transform respect from a discretionary value to a global principle, based on the belief everyone matters. So stupid, I learned, I was/am not … just a person with a different learning style, preference, and perspective. Thanks to people like Albert Einstein … one of my key role models … for helping me to understand and embrace all of who I am. 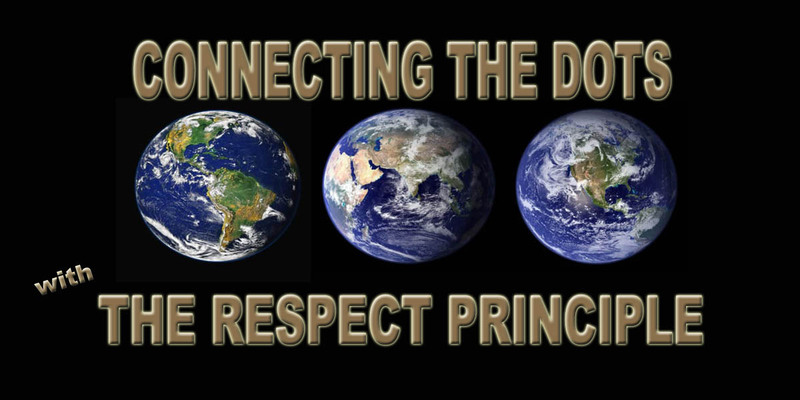 Connecting the Dots … with The RESPECT PRINCIPLE first limited edition and sample run rolls off the press this May … to get not only your signed, but your numbered copy, place your order today! Both come with the new “Mini Workbook” section at the end of the book!
. AVAILABLE MAY 2015 … ORDER YOUR COPY NOW! The first bulk publishing and printing run rolls off the production line this summer … just in time for the company’s one year anniversary launch date 9/11/2015 and the fall semester. Final proofing and into production the week of May 25 to the 29th! TO BE SURE YOUR SCHOOL IS ONE of the LEADERS … ORDER A LIMITED EDITION COPY to REVIEW … and then, QUICKLY PLACE YOUR ORDER TO ENSURE SEPTEMBER DELIVERY! ALSO … CHECK OUT WHAT ELSE IS ARRIVING THIS SEPTEMBER … ON the BOOKS, PRODUCTS, and SERVICES PAGE!